The Lincolnshire based artist Les Brown has so far had four large and very successful one-man exhibitions of his work in the city of Lincoln. His last exhibition, entitled ‘Coast to Coast’ included over fifty large paintings based on areas of outstanding beauty and interest throughout Great Britain, created over the last four years and was seen by over 600 people, including visitors from the USA, Australia, Japan, China and mainland Europe. The exhibition was very successful and a number of original paintings and prints were sold. The main focus of his work are landscape images, but he has also completed a number of portrait commissions as well as large floral paintings. His landscapes take in a wide range of subjects from around the British Isles, but his favourite places to visit and work are coastal areas, the mountainous, rugged, often bleak terrain of the Highlands or National Parks and forests or woodland areas. Of his work, he says “My aim is to communicate my feelings and ideas about the places I visit, by trying to capture their essence, atmosphere, as well as their magnitude, fragility and beauty. I wish to draw peoples attention to what is often familiar to them, by focussing in on a place in order to share with them, the emotional attachment I feel, so they can experience my vision through the images I create”. Les works mostly outdoors, using soft pastels, preferring their rich colours and the speed at which they can be blended to capture the ever changing light and shadows of the natural world he is so fascinated by. 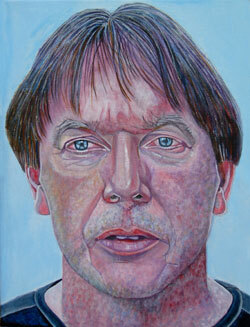 He also uses oils and acrylic paints on canvas, as well as watercolours. People who have acquired pieces of his work, have quickly become collectors and his pictures are always in demand. Les is a fully qualified lithographic printer, has a BA(hons) degree in sculpture and has successfully taught students and adults of all ages a wide range of art specialist skills, since moving to the County of Lincolnshire. Les is currently working on producing a new group of landscape images for his next “solo” exhibition to be held at The Sam Scorer Gallery in Lincoln in March 2019. Original works can be purchased by contacting Les directly by telephone or email.